LOS ANGELES, Dec. 30, 2011 – Now on the threshold of the Olympic year of 2012, there is a seemingly unending parade of sporting events – college and pro football, college and pro basketball, hockey and some other things – many with attendance in the tens of thousands and sometimes close to 100,000 people for a single event. All for sports; you don’t see crowds like this for theater or opera, and rarely even for concerts or civic events. When considering why, I can’t help but think of Kenyan marathoner Edna Kiplagat. Sure, she’s the 2011 World Champion from Daegu, but that’s her current status. It was a lot different just a couple of years ago. 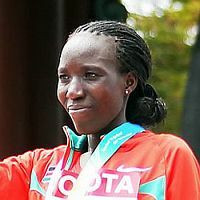 Kiplagat had won silver and bronze medals in the World Junior Championships 3000 m races in 1996 and 1998, respectively, but as the new year of 2010 dawned, she was 30 years old with few prospects. She hadn’t distinguished herself on the American road circuit and was nowhere among the World Rankings on the track. Coached by her husband, Gilbert Koech, a former Washington State distance star (and a 2:14:39 marathoner), she had only run one marathon, an unexciting 2:50:20 in Las Vegas in 2005. We got talking about life, and Edna was telling me how much she had struggled trying to get into running, and she had reached the point of giving up. I was telling her about how the L.A. Marathon really changed my life and started me off to where I’ve been, because we all need something, we need a chance and the LA. Marathon gave both of us a chance to re-discover our talents and it was really amazing the way she was really talking highly about the L.A. Marathon. It was the last chance she had, the only chance. She said she tried to get into races, but she couldn’t get in any races; the only race that would take her in was the L.A. Marathon, so she talks high of the L.A. Marathon and the chance. The rest, as they say, is history. She won the Honda LA Marathon with a 24-minute improvement to 2:25:38, winning $145,000 in cash (including $100,000 for beating Korir to the life in the race’s unique male vs. female challenge) and a new Honda sedan. She said afterwards that she “was not surprised” by the results because of her fitness in training, but her smile at the finish line (shown above) underlined her change of circumstances because someone gave her a chance. She’s had no trouble getting into races since. Eight months later, she won the ING New York Marathon in 2:28:20 for another $130,000 in prize money. That set up her 2011, which notably included a personal-best 2:20:46 for third place in the London Marathon in the spring and then a solid 2:28:43 victory in the World Championships marathon in Daegu, South Korea, leading a Kenyan sweep of the medals. At 32, she’s now among the favorites for the Olympic title to be determined in London in August. But none of this would have happened except for the opportunity afforded her in Los Angeles almost two years ago. It’s the surprises in life, the uncertainty of sports and the achievements – often unpredictable – of people like Kiplagat and so many others that makes sports so great. Judging by the crowds for sporting events across the country during this holiday season, even in difficult times, many people agree. Here’s hoping that 2012 will be the great sports year it promises to be; a lot of us will be watching closely.